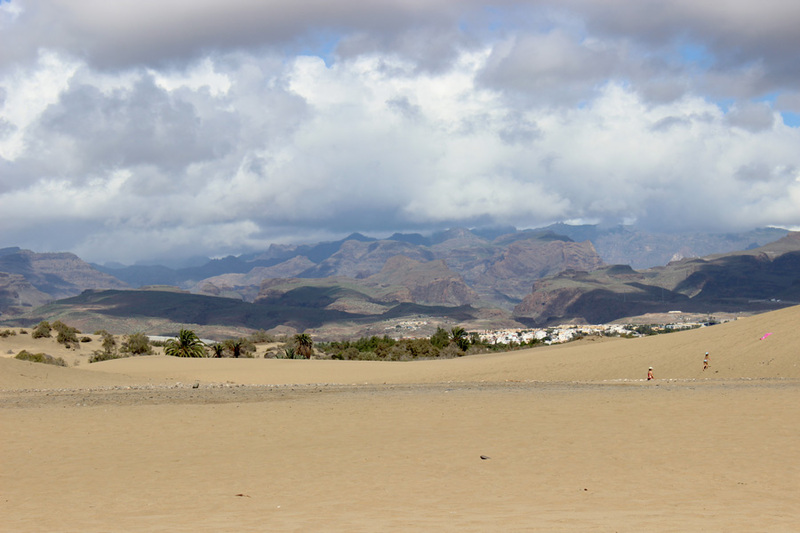 A few weeks ago, me and a friend set off to the Spanish island of Gran Canaria. 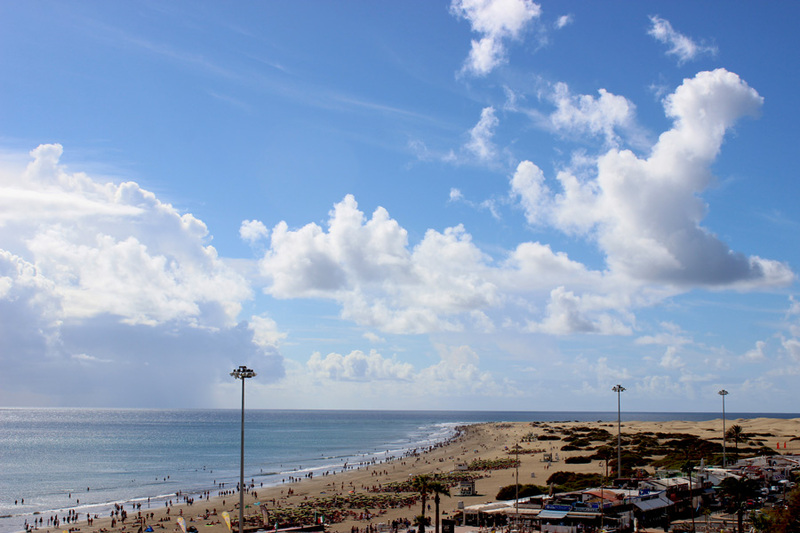 Due to its location next to Morocco, this Canary Island has a pleasant climate year-round and is perfect for a week of exploring. 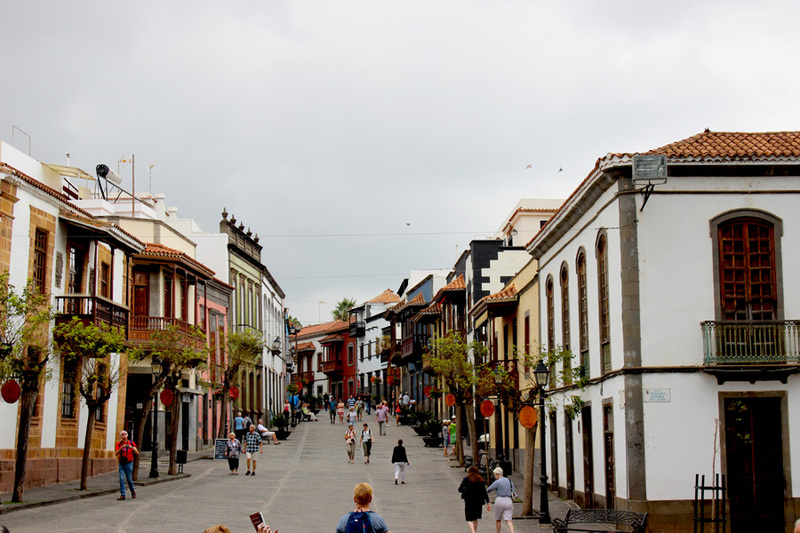 While most of the southern part of Gran Canaria is ‘spoilt’ by mass tourism resorts, there are still plenty of places that offer peacefullness and great cultural experiences. You just need to know where to look. Since we were fairly limited, as we decided not to rent a car this time, we got to know the local bus system and joined some tours that made our stay a great one. And of course we are more than happy to share the itinerary! If you have rented a car, that’s great! 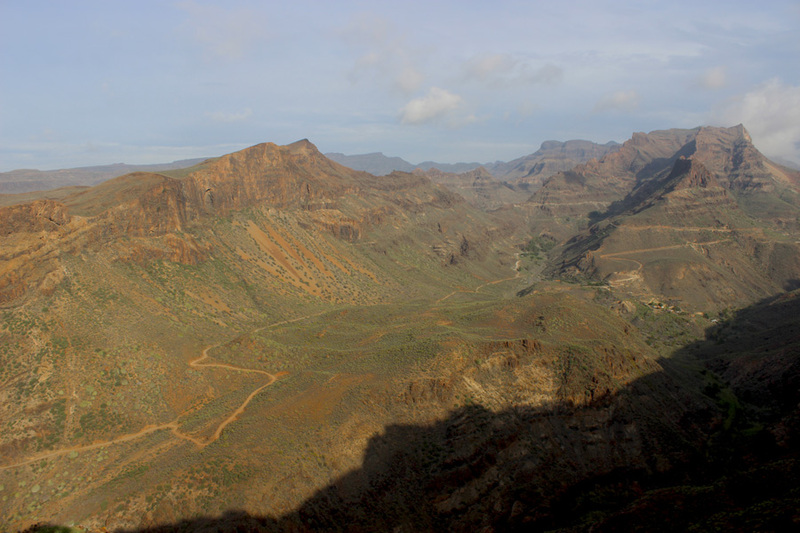 Because the mountains on Gran Canaria are amazing and definitely worth going on a road trip for. If you are like us and do not have a car to use, the best way to see the mountains is by joining a bus tour. 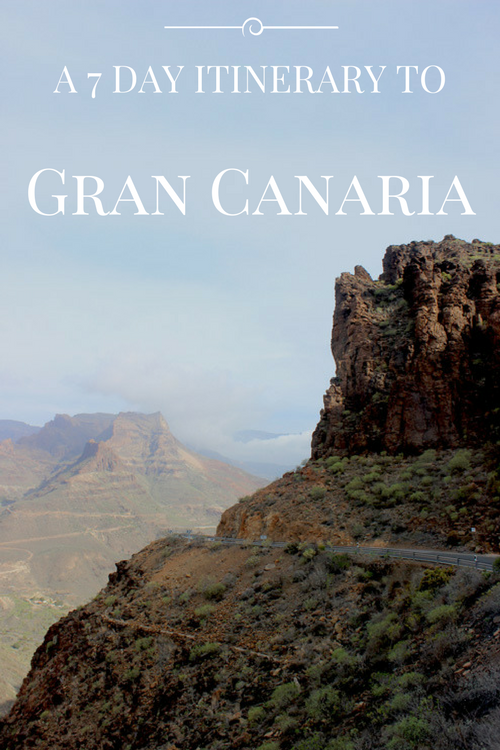 We were kindly invited by Tours in Gran Canaria to experience one of their bus excursions. On Thursday morning we were picked up by the bus right in front of our hotel. After we picked up a few others from their hotels we set off to the mountains. 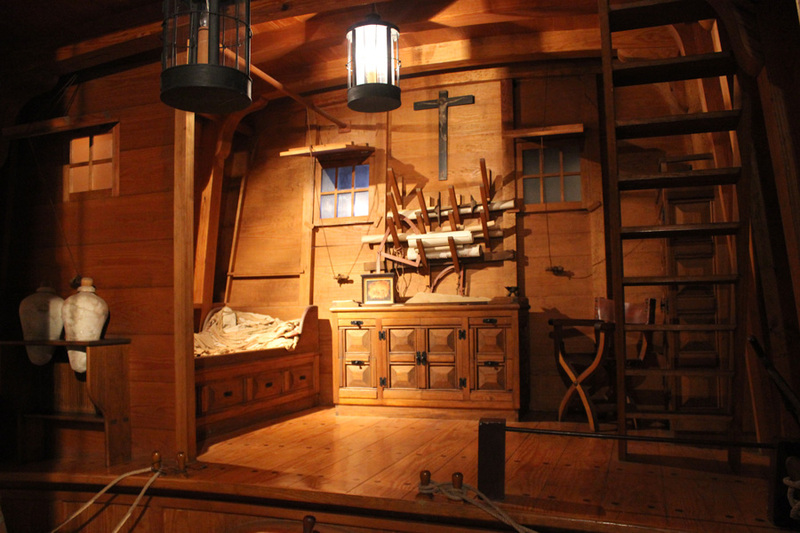 The tour in total lasted the entire day, and it is a great way to visit the highlights and learn more about them. 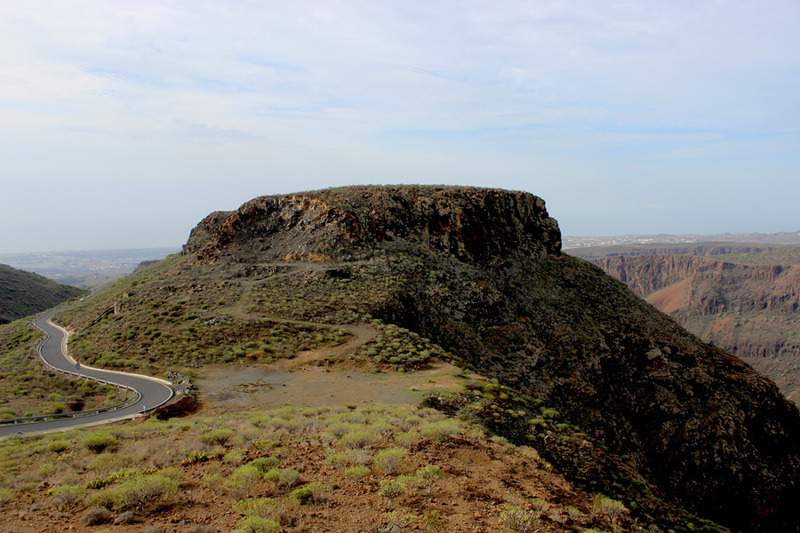 Stops included the Grand Canyon of Gran Canaria, symbol of the island Roque Nublo (Cloud Rock), the beautiful town of Teror and a aloe vera plant. Our host was extremely friendly and made sure that everyone was having a good time. She explained more about the island’s nature, towns and people in Spanish, English and German. Her skillfully switching between the three languages made us jealous! I still stumble sometimes switching from Dutch to English and vice versa! 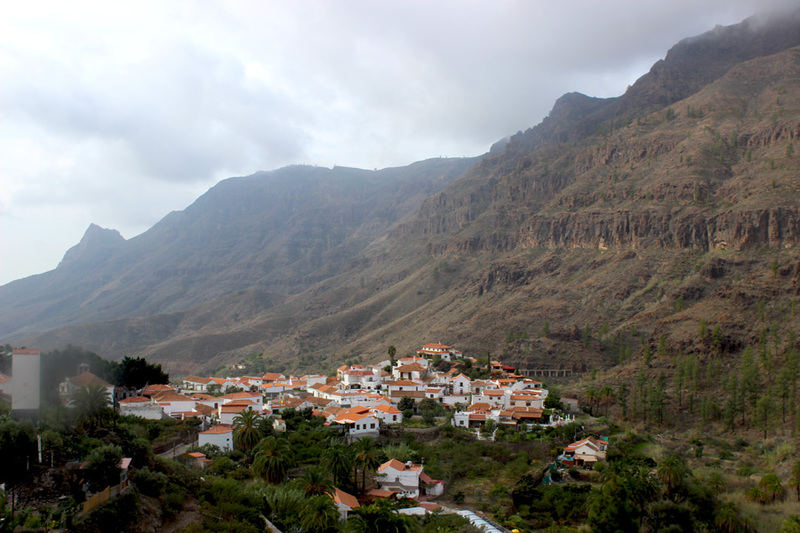 During the day we also saw the Valley of 1000 Palms, the town of San Barolomé and the Bandama volcano. Halfway the day we stopped for lunch at a restaurant with a panoramic vista over the valley. Unfortunately, the fog blocked the views for us that day. I must say, all in all the excursion was a great introduction to the island and provided us with a wonderful day out. 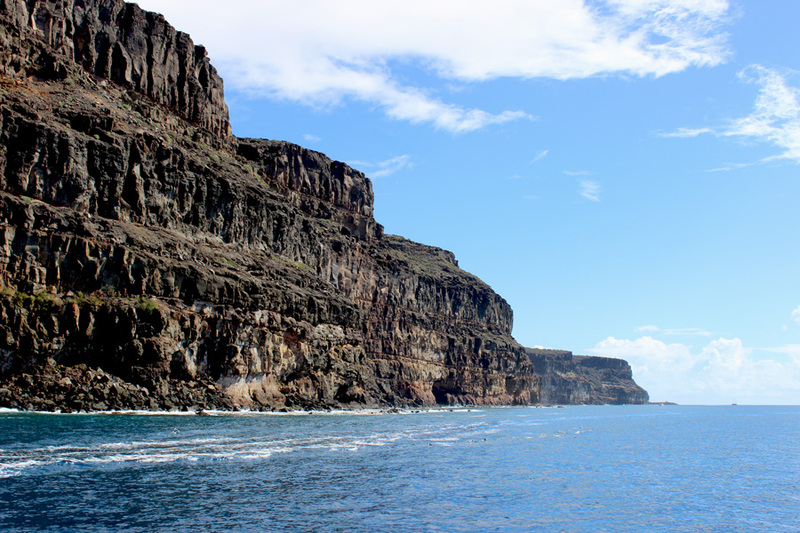 To see Gran Canaria from a different perspective, I can highly recommend joining a boat tour. 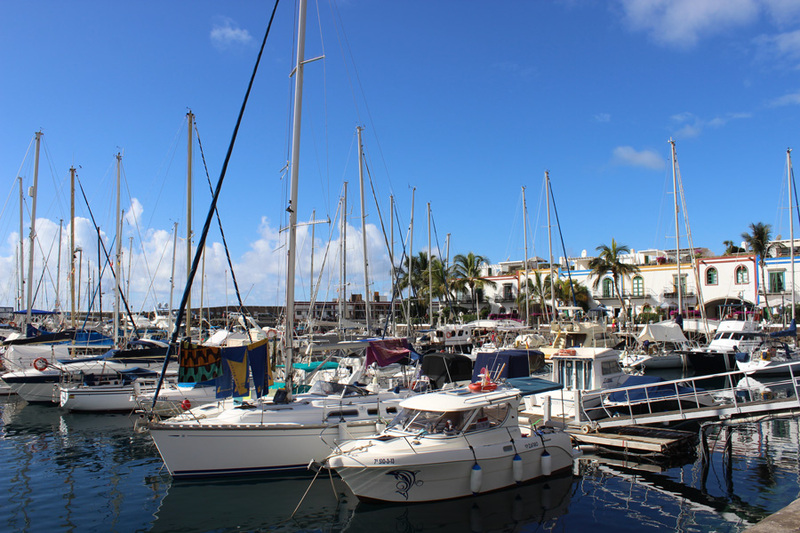 We were kindly invited by Gran Canaria Boat Trips to experience their new catamaran tour from Puerto de Mogan (more about this town further down). 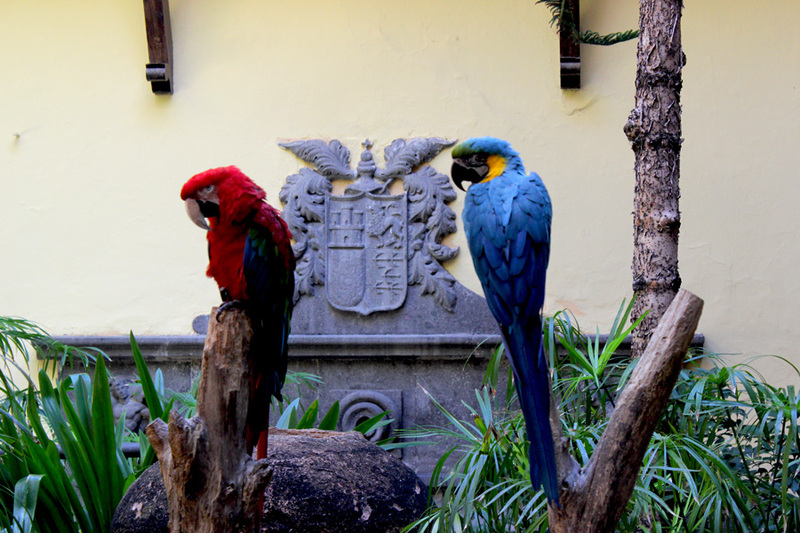 Besides a few miscommunications between Gran Canaria Boat Trips and the tour operator which were solved fairly quickly, we had great fun that day. Again, we were picked up by the tour operator at our hotel in the morning. We met a few of our fellow travellers and once arrived in Puerto de Mogan we had another 45 minutes or so to explore the area. 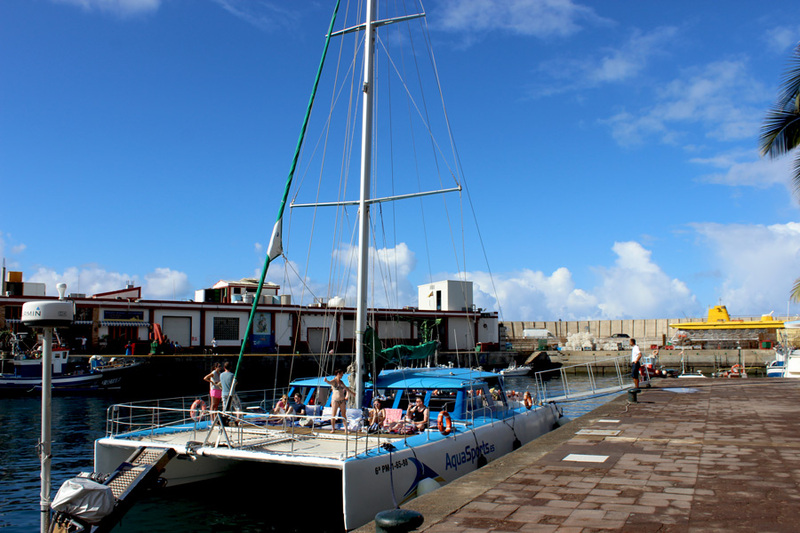 The catamaran was waiting for us in the harbour and we were thrilled to hear that this would be our ride for the day. We settled with our towels on the deck and enjoyed the sunshine and the tour. All drinks were free during the tour, and around lunch time we received a great meal. Also included in the tour was a banana boat ride. However, due to the fact that we just had our lunch, we decided to bail on this one. What we were in for though was a fun parasailing adventure. 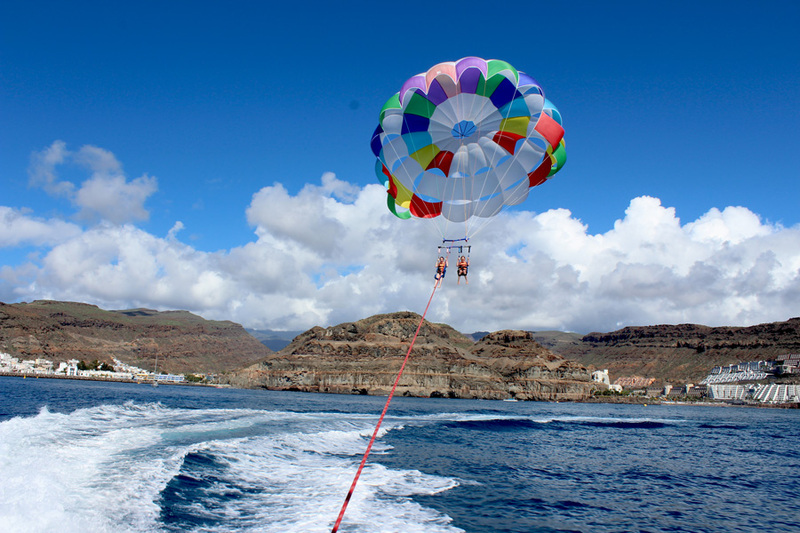 Parasailing and a jet ski ride are optional with this tour, and come at an extra fee. After the tour, we were taken to an office where we could see our parasailing pictures. We received a USB stick with 51 pictures on it for 18 euros. We were with the two of us, so that of course was a bargain. And a great souvenir to keep. During the tour we kept our eyes peeled for dolphins, but we weren’t lucky this time. The tour itself was great and a very relaxing way to see the island from a new angle. 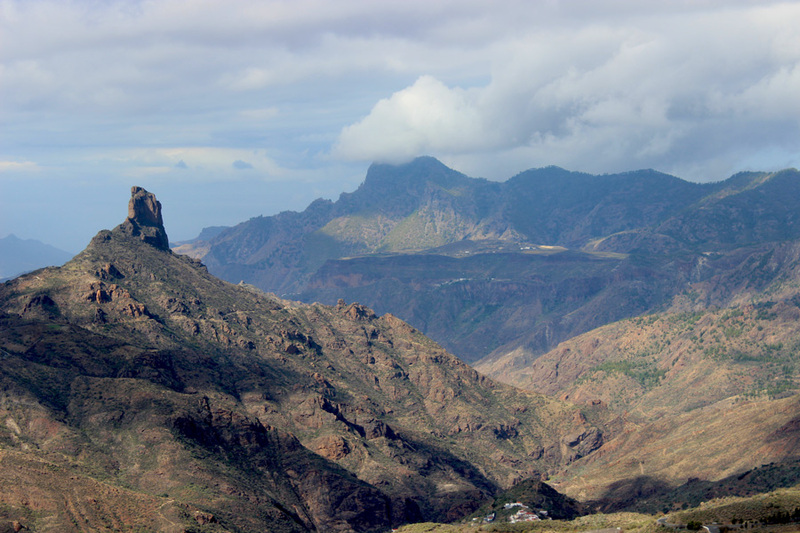 Not only did we get to see Gran Canaria this way, we also saw the island of Tenerife looming up in the distance. Another great day out. For the photography professionals and hobbyists among us, pay attention now. 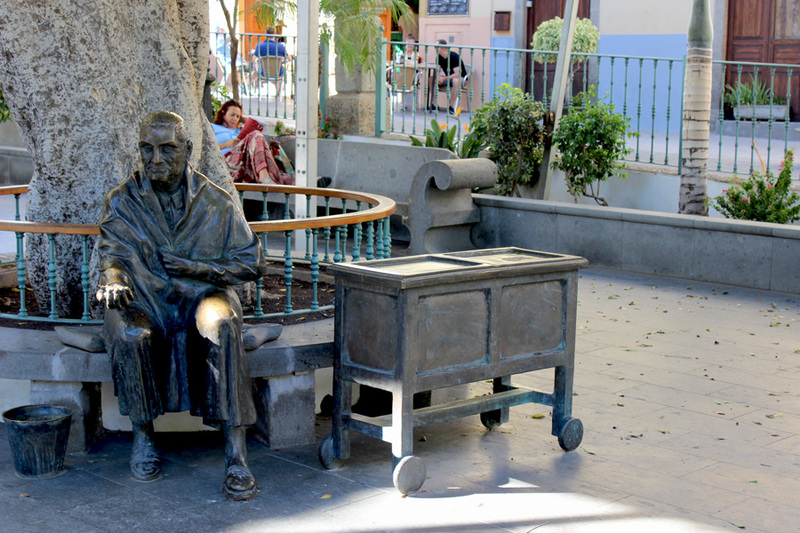 Agüimes is situated five kilometres from the east coast of Gran Canaria, and about 26 kilometres from Las Palmas. This gem just in the mountains is an absolute photographer’s paradise. 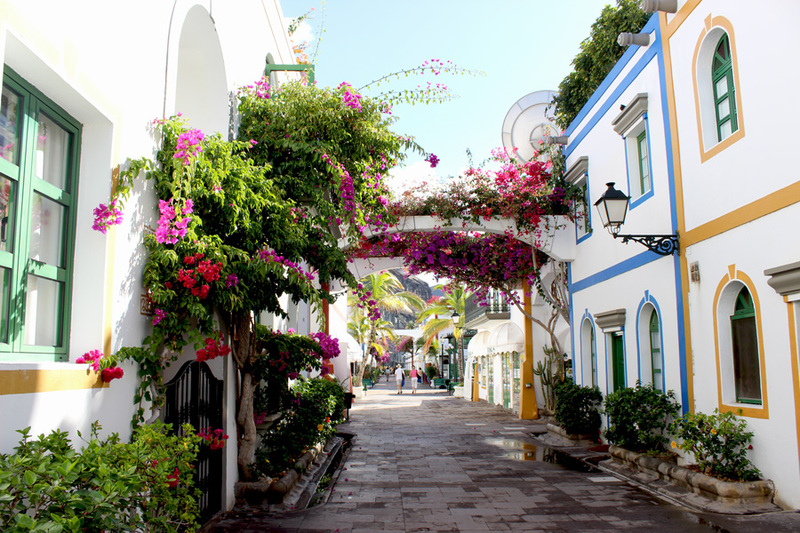 Narrow, colourful streets, and statues in all shapes and sizes around every corner. It has a very Moorish feel to it, and most importantly (at least for me), you will notice that tourism is not as massively developed here yet compared to the southern part of the island. It feels a bit like a pleasantly sleepy town, where the inhabitants can be found on the squares and on the terraces of their local cafes. They all seem to know each other and stop easily to make a chat. I also found that the town offers a lot for the artsy fans. Without knowing what it was, I stumbled upon another colourful entrance that led me to three workshops. There was only one other lady there, and she explained to me that this used to be a typical Gran Canarian house that was converted into a workshop. Currently there are three artists creating their work. The first one creates objects from old plastic, the next one is a painter and the third artist makes ceramic objects. From the third artist I bought a ceramic magnet in the shape of a salamander. 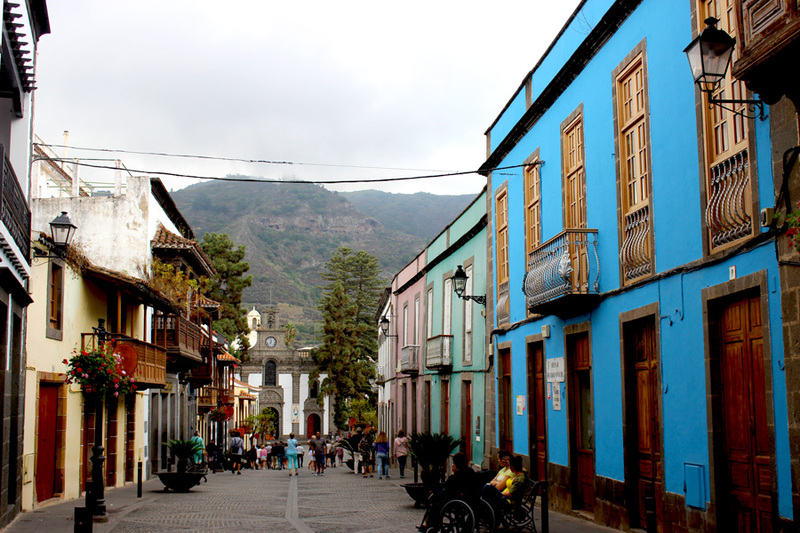 Agüimes is easy to reach by car, and has a bus station with bus connections to Las Palmas. 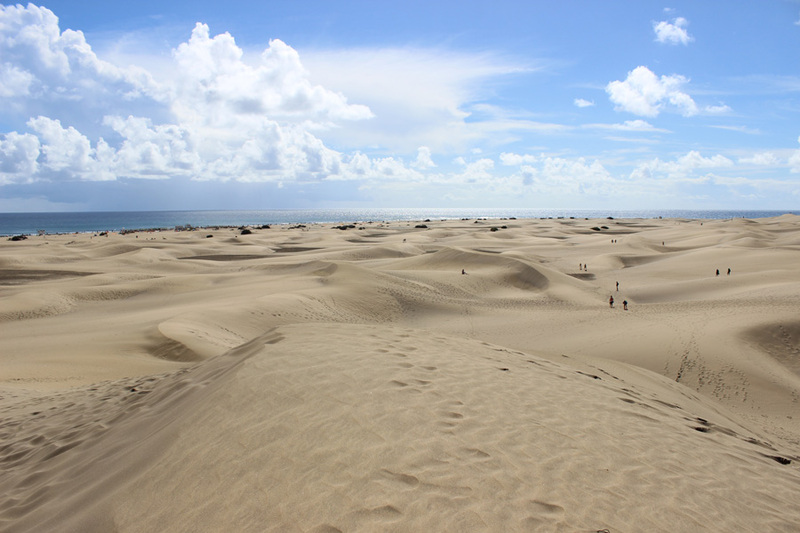 Tucked between the resort towns of Maspalamos and Playa del Ingles you will find an interesting natural phenomenon. A 404-hectare area of sand dunes have built up here after the last ice age. 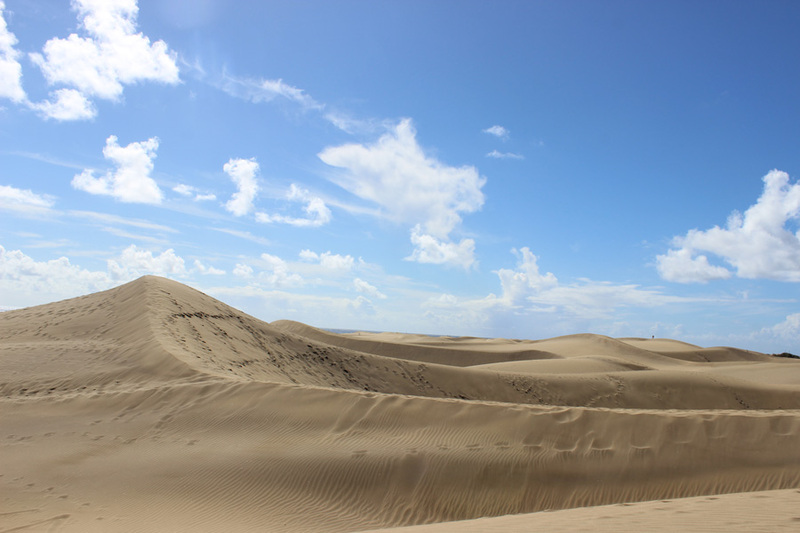 The dunes give quite some interesting views and of course ample of photo ops! Of course we experimented as well! On the coastline of this area you will also find some more secluded beaches, as well as busy ones. So great about this place is that the Atlantic Ocean remains having a comfortable temperature year-round, making it excellent for swimming. 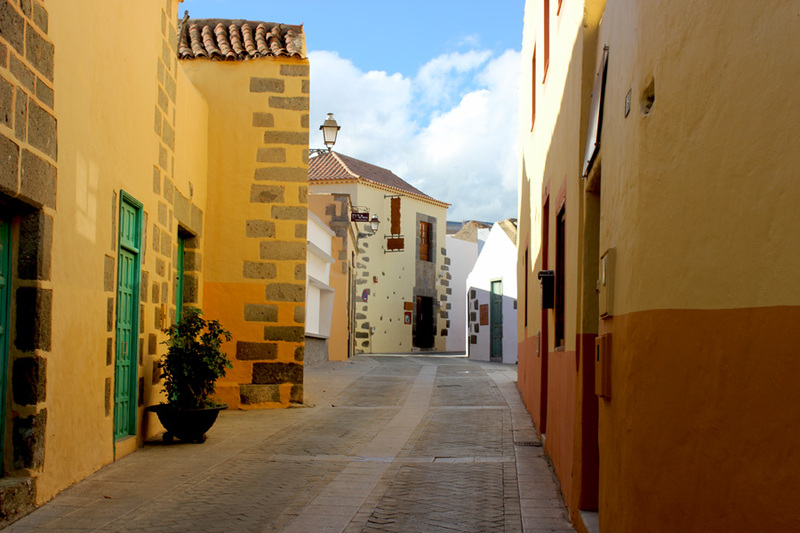 Our catamaran tour departed from Puerto de Mogan, and we had some time to explore this lovely village. 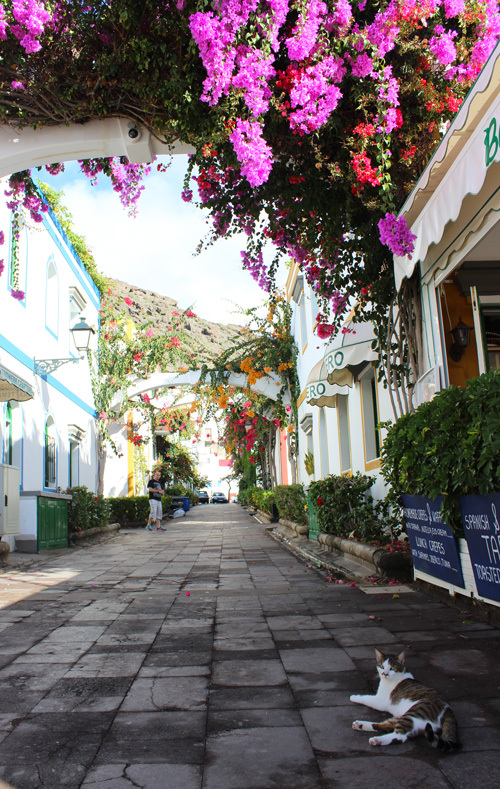 All set up for tourism, but in a positive way, this town boasts pedestrian-only streets filled with flowers in all colours. It is absolutely lovely to stroll around and take pictures. Of course it would not be a tourist town without a beach, so there is a nice one right next to the centre. ‘All roads lead to Las Palmas’ holds definitely true. 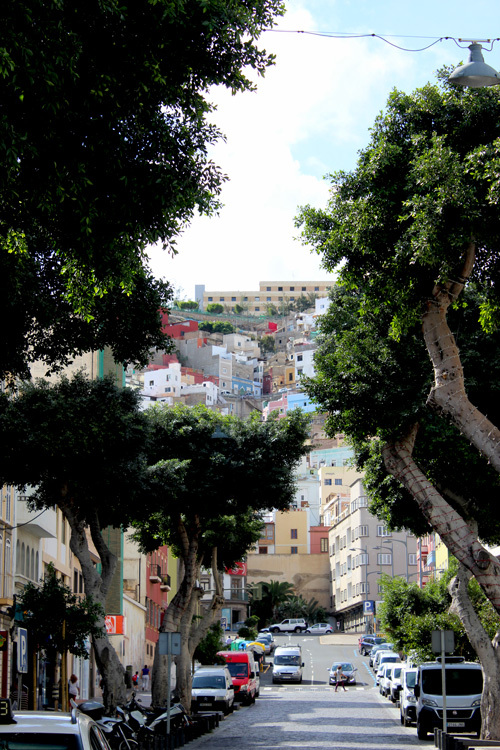 The capital city of the island is therefore easy to reach by car and public bus. 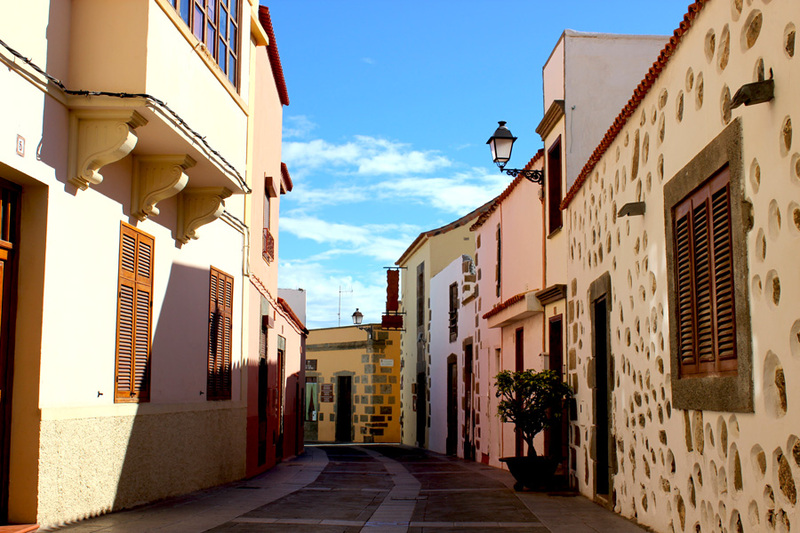 Definitely a must here is a visit to the Old Quarter, which is comprised of the neighbourhoods of Vegueta and Triana. 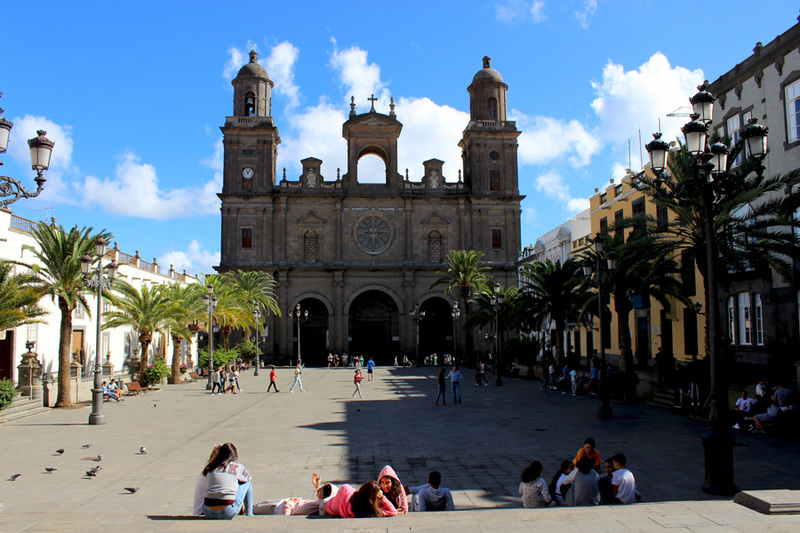 Even though Las Palmas is the capital city of the island, it did not feel touristic at all. To me personally, that is always a big bonus! 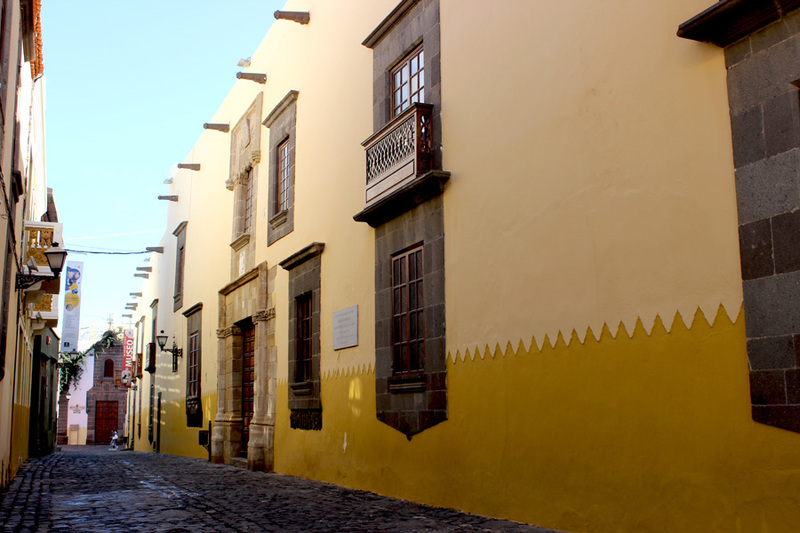 Medieval and narrow streets are filled with colourful houses, and also the cathedral de Santa Ana is a beautiful building worth a visit. 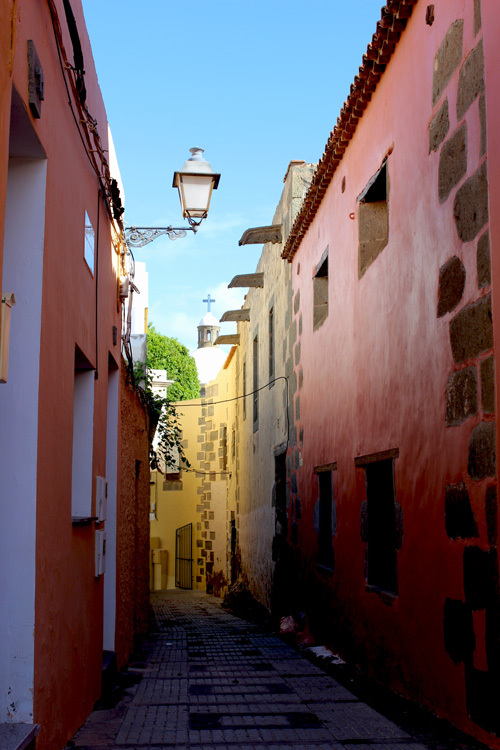 What makes this town so interesting is that it is the first Spanish city that was built in the Atlantic, right before the discovery journeys started that led to Christopher Columbus discovering America. 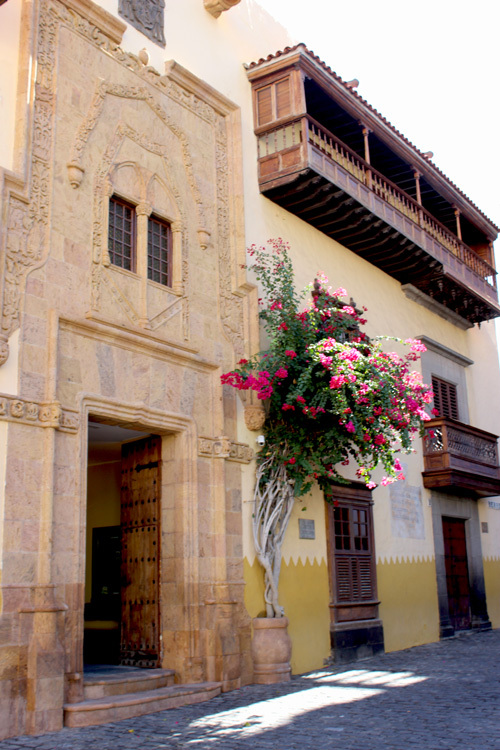 This history is well described in Museo Casa de Colon: the former governor’s home that Christopher Columbus used as a stop each and every time before he went on a journey. 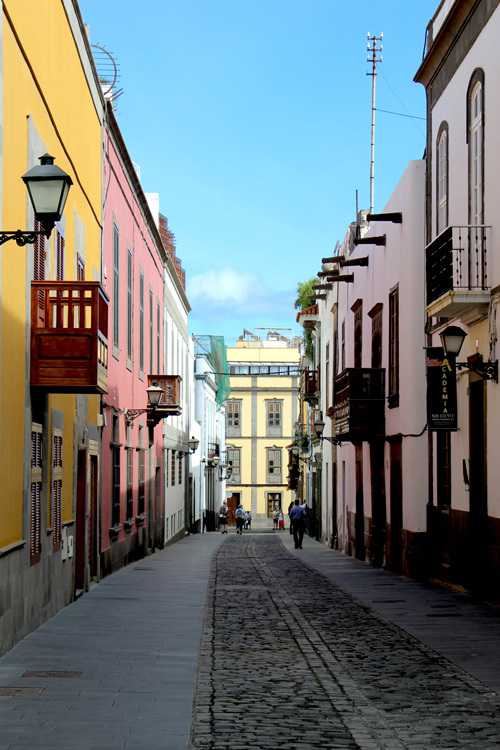 Outside of the historic quarter you can find some good shopping streets, as well as parks and beaches. On day seven you have deserved a day on the beach. Luckily enough, these are scattered all around the island in all shapes and sizes. The beaches in the south I feel are more mass tourism. However, even here you will definitely be able to find some more secluded ones on offer. I must admit that with my adventurous nature, it was challenging to not having a car on this mountainous island and only being dependent on local busses. However, both tours we did during the week were great ways to break out of the touristic areas and really explore the island better. 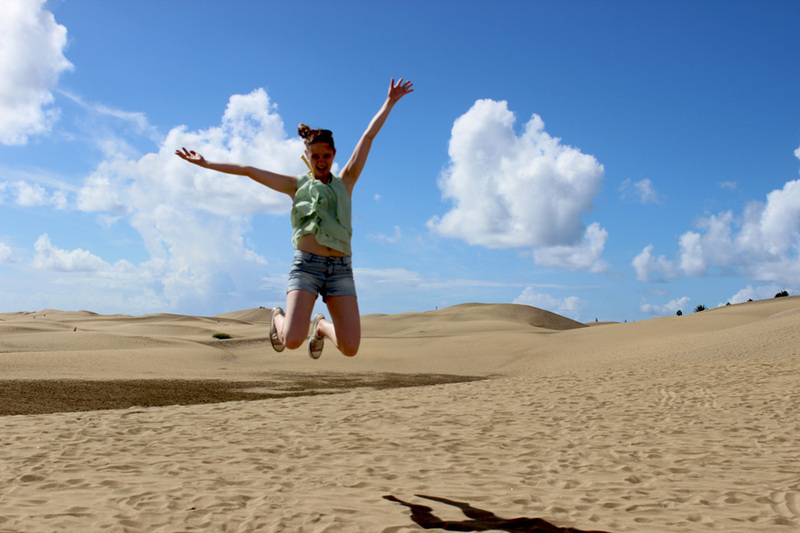 Over to you: have you ever been to Gran Canaria, and what were your favourite bits? 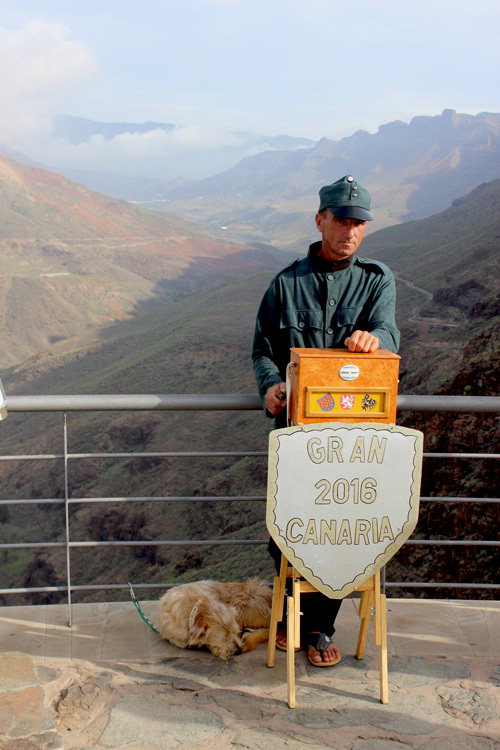 Disclaimer: I was kindly invited by Ok Gran Canaria and by Gran Canaria Boat Trips. However, all pictures and opinions are my own.